We launched our boldest campaign ever. As president of the University at Buffalo, I believe that propelling our institution to great new heights is among our most fundamental and fulfilling endeavors. On behalf of our entire UB community, thank you for your support and partnership. 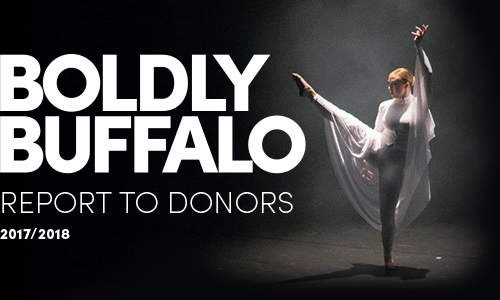 Since launching UB’s Boldly Buffalo campaign in April, the university has seen unprecedented support. Alumni and university champions from around the world are making gifts in support of this historic campaign. You are receiving this report because you are one of those generous individuals—thank you! At UB, being bold means helping citizens in Western New York and around the world improve their environment and community while generating economic growth. And that’s just what three UB students—Team ElevateHer—sought to accomplish through the World’s Challenge Challenge. His gift created an endowment to support the Stephen Still Institute for Sustainable Transportation and Logistics, a center that unites UB engineering and management schools to address the growing new field of transportation, logistics and supply chain management.